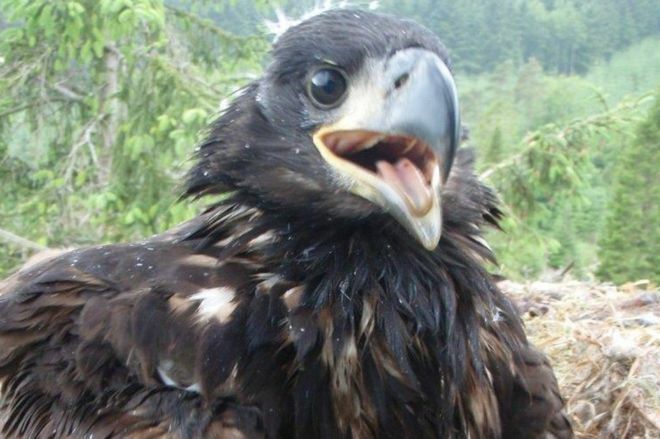 My goodness, it has been the most challenging season for Mull Eagle Watch! We’ve had some great highs and way too many lows but still, we managed to salvage the season and end with some fantastic and well-deserved news. Here is a summary of the key events that occurred this summer. We were spolit with eagle action last Thursday at West Ardhu! Hope arrived with a measly portion of food but, instead of dropping it in the nest, she perched underneath Misak to eat it herself, despite the incessant calling from the hungry chick. Where did all that lovely weather go? I’m, once again, living in waterproof overtrousers and boots which have been damp for days. However I can’t help but pity the eagles more than myself as they sit sheltering under branches, holding their wings out to dry. 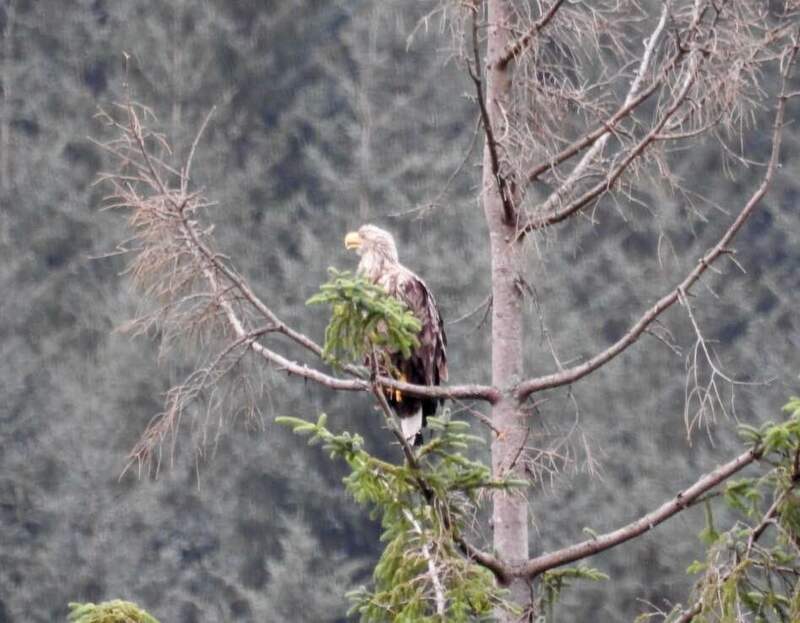 Alongside tours at Craignure and Tiroran, Mull Eagle Watch is now running tours at the West Ardhu eagle watch at Dervaig, owned by North West Mull Community Woodland Company. We return to Hope and Star, the pair we watched here last year. They have successfully raised and fledged two chicks again, which are now 14 weeks old, and we’ve been seeing lots of action even in our first week here! Due to the nest failure at Craignure Golf Club, we have now re-opened tours at Tiroran Community Forest! We are still running tours at the golf course but sightings of eagles can, sadly, no longer be 100% guaranteed. The first week of tours at Tiroran are now over and Fingal and Iona have not disappointed! Unfortunately, as many of you know, the first nesting attempt of the Golf Course eagles failed and we were crossing everything in hope that they may re-lay. They teased us with some promising signs such as bringing back nesting material, performing aerial displays and then for four days, they appeared on the nest in the incubation position but… nothing. On Good Friday, when people all across the country (including myself) were getting excited about tucking into their (*cough* nine) chocolate eggs, we at Mull Eagle Watch were most excited about an egg that wasn’t chocolate at all. It was the first egg that Scalla and Anna had laid in their nest at Craignure Golf Club. Mull Eagle Watch tours have come to an end after another successful season in 2017. Thursday 21st was the last day of tours and, after cancelling on the Wednesday due to a return of miserable weather, I was pleased to be greeted at West Ardhu with sunshine and clear views. At last, after a long and nerve-wracking wait, the chick at Tiroran Community Forest has successfully made her first flight. Watching, waiting, anticipating... a fledge! The eaglet at Tiroran Community Forest is just over 10 weeks old today and is set to fledge within the next couple of weeks. White-tailed eagles usually fledge at 12-13 weeks old so it has a little longer to go yet before it makes its first flight and our visitors are seeing it becoming ever-more active in the nest. The huge eaglet in Tiroran Community Forest has been getting flappy and giving our visitors fantastic views! 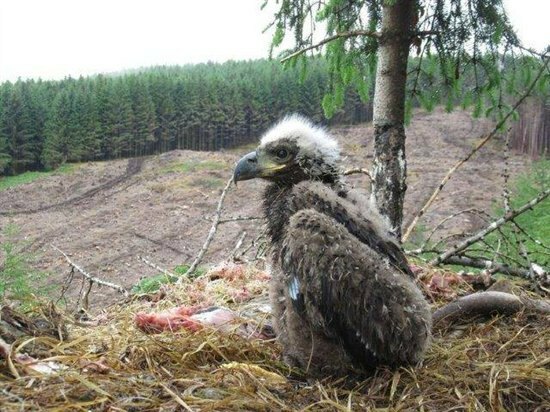 On Friday 9th June, Mull Eagle Watch visitors witnessed the special moment when our chick at Tiroran Community Forest earned its very own leg rings. 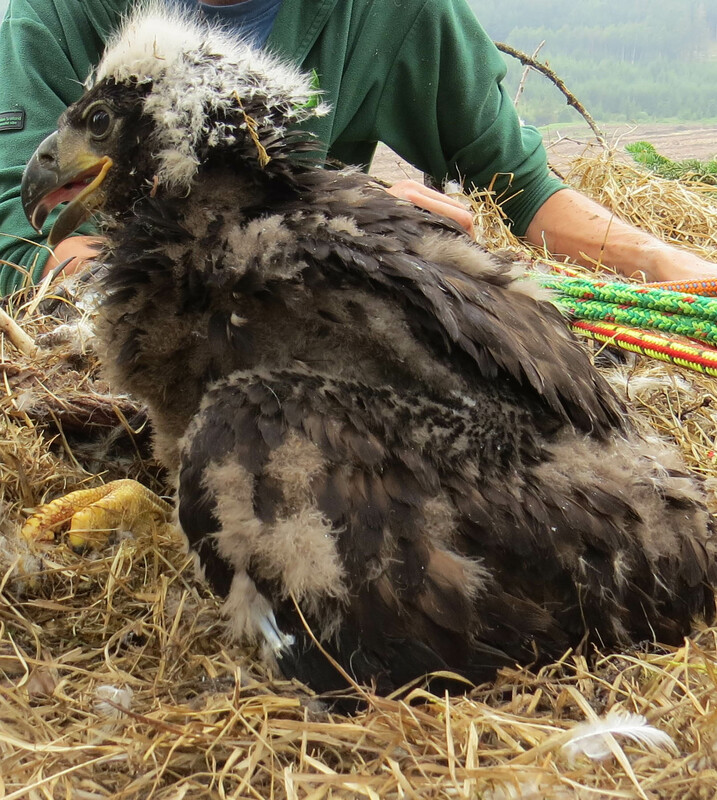 Our Tiroran Community Forest eagle pair, Fingal and Iona, have hatched two chicks this season. Iona laid her eggs on 1st April and, with a 38-day incubation period, we expected them to hatch around the 8th May. When I arrived in the forest on 9th May to set the scopes up on the nest for the day’s tours, I witnessed, for the first time, Iona feeding something in the nest! I am only just getting round to posting the first blog post of the season after a host of technical issues and general eagle busyness with our pair, Fingal and Iona. 2017 tours are well underway already! As you know Mull Eagle Watch has now closed for the 2016 season and what a season it has been. The Forest is alive with the sound of ..... Nature! The chick at Tiroran is now flying like an old pro! It hasn't taken him long to master the skills of picking up a thermal, a warm pocket of air to give him some height, and showing off some beautiful soaring. Fingal and Iona are never far away, and are still bringing in food as the chick is not independent yet, but that will not be long. Remember this? The bundle of fluff here is the chick at Tiroran when he was being ringed in the middle of June. Sunday evening, sat looking out on a flat, mirror like Sound of Mull with the sound of oystercatchers and curlews as my background music - I'm not sure it gets much better.